Comments: Having previously had his U.S. adventures reprinted in a variety of Marvel U.K. titles, on 25th February 1981 Captain America received his own U.K. title. As with the majority of British comics of this era, the interiors were black and white, the title was an anthology, with Cap initially sharing his comic with Iron Man, Defenders and Dazzler, and the early issues included free gifts to entice buyers to try the comic out - in this case, the first two issues included stickers of Marvel characters. 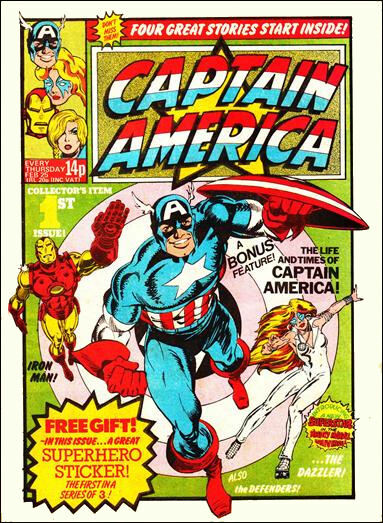 Starting with the 21st issue, the title absorbed Marvel Action, whose Fantastic Four strip replaced Defenders, and Marvel Super Adventure was similarly incorporated into Captain America with issue 37, bringing with it glossy covers, Daredevil and a handful of colour pages per issue. Captain America cancelled on April 3rd 1982 with its 59th issue.